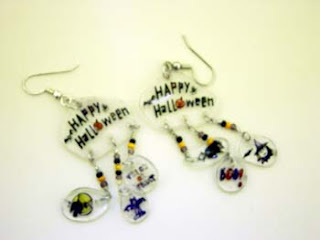 Before Halloween is over, I just quickly wanted to show you the earrings I made that are similar to the Halloween bracelets. I did not seal the plastic (as I should have) and some of the marker is wearing off, because these have been in my purse since I wore them last week. Of course, since they're so quick and easy to make, I can always make more that are better, stronger, faster, ummm where was I? Oh well, Happy All Hallow's Eve! !